All load tests on cranes & monorails are done in the plant, using water weights. Illinois Crane load tests all cranes and monorails to 125% of capacity to ensure unrivaled performance. The test also verifies that the equipment meets specifications and safety requirements. Regular load testing helps prevent failure of critical material handling equipment, thereby minimizing downtime and maintaining productivity. It also helps minimize the chance of an accident. Illinois Crane’s load test program analyzes all key load-bearing equipment components under the most extreme conditions. Worn and failing parts are reported to the customer, and replacement of those parts can be done immediately to bring the equipment into compliance. Why not contact an Illinois Crane representative today to see how regular crane and monorail load testing can benefit your company. Hoist load testing is yet another valuable service of Illinois Crane. Load tests on all hoists are conducted in Illinois Crane’s service facility. Customers can simply ship the hoist to be tested to Illinois Crane. A replacement hoist can be provided by Illinois Crane, if requested, thereby minimizing downtime. After being received, IC technicians anchor the hoist to a test frame in preparation of a hydraulic stress test to check performance. All hoists are tested to 125% of capacity to meet load specification requirements before being put into service. 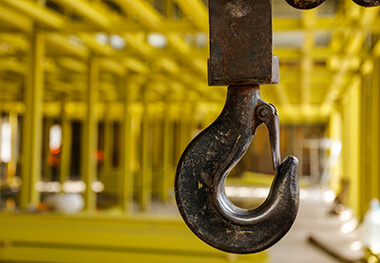 This thorough inspection pinpoints potential weak components in the hoist that could cause catastrophic failure– then, repair recommendations are made to the customer and completed by Illinois Crane’s Service & Repair Department, if necessary. The end result… a hoist that is safe and in compliance with government regulations! Keep your plant hazard-free and running smoothly by contacting Illinois Crane about this important diagnostic service.